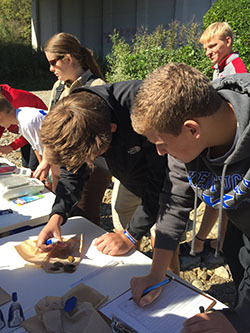 On Monday, October 10th, Mrs. Wheeler's Environmental Science class went to Rockcastle River - near Mt. 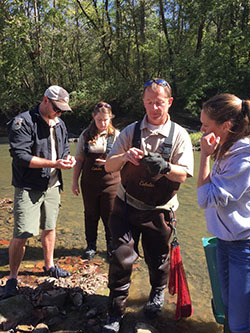 Vernon, KY - to reintroduce mussels raised at the Center for Mollusk Conservation. Students learned the importance of mussels in the ecosystem and the pollutants that have reduced the population in the area, including fertilizers and pesticides. They tagged the mussels by gluing tiny little numbers to each shell, weighed them, measured their length with calipers, and placed them in the river. Students worked with world-renowned malacologist Dr. Monte McGregor.